The Gerald Exclusive Lifetime Warranty is INCLUDED on ALL NEW and select USED vehicles, at NO extra charge to you! This exclusive warranty comes at no extra charge with all our new Nissan models and with select used models as well. Our warranty was designed with customers like you in mind, to help your car stay covered so you can enjoy an amazing ride for many more years. We are able to offer such a great warranty because we know our cars are high-quality, durable and reliable; it is a commitment to the quality of our products. This warranty is only available at Gerald dealerships, so you won’t find this kind of coverage anywhere else. What is covered under the Gerald Exclusive Lifetime Limited Powertrain Warranty? To learn more about our great warranty coverage, don’t hesitate to contact us. Then when you’re ready to get behind the wheel of a new car, we will help you find the vehicle that’s perfect for you and help you make the most of our excellent warranty when the time comes. 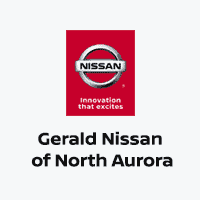 Stop by our North Aurora, IL dealership at any time and we’ll help you get started. *This is not intended as a complete description of the coverage offered. For complete details please see your warranty contract upon purchase. See dealer for details.